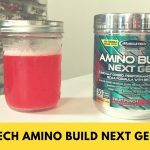 Home » MuscleTech Amino Build Next Gen Review — Is It Really That Advanced? 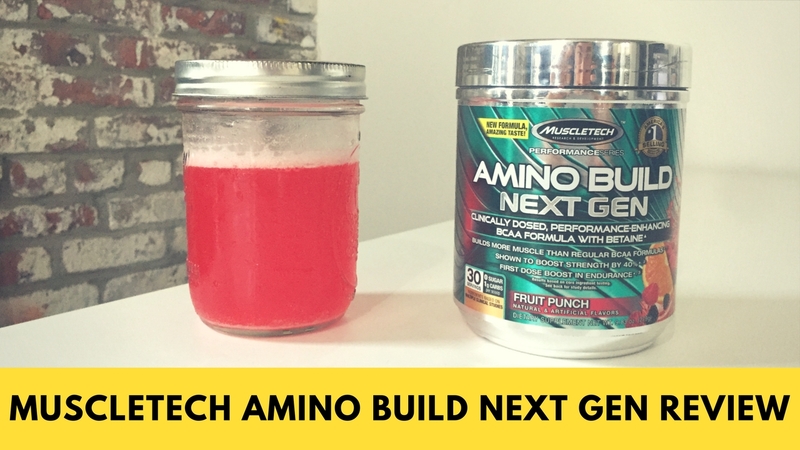 MuscleTech Amino Build Next Gen Review — Is It Really That Advanced? MuscleTech is owned by Iovate Health Sciences in Delaware, and they’re certainly one of the more familiar names in the business. They sell a huge variety of different products that are arranged under different lines like the Performance Series, Lab Series, Essential Series, and Pro Series. We wanted to try one of their branch chain amino acid supplements, and the Performance Series’ Amino Build Next Gen promised to be something extraordinary. It has a host of extra ingredients beyond the standard BCAAs, and the tub itself promises that it “builds more muscle than regular BCAA formulas.” How come? 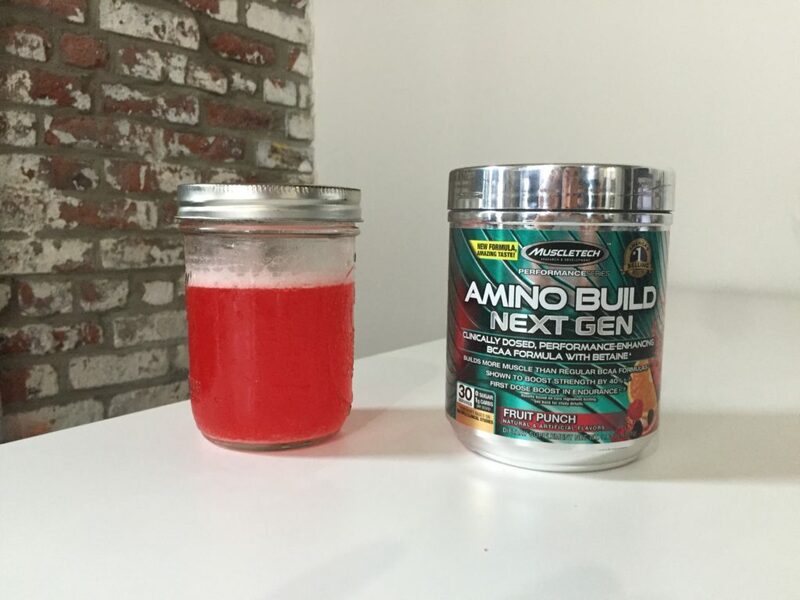 Shop MuscleTech Amino Build Next Gen HERE. With 25 calories per scoop, this is a relatively high calorie BCAA supplement. (Most are 5 or fewer calories.) 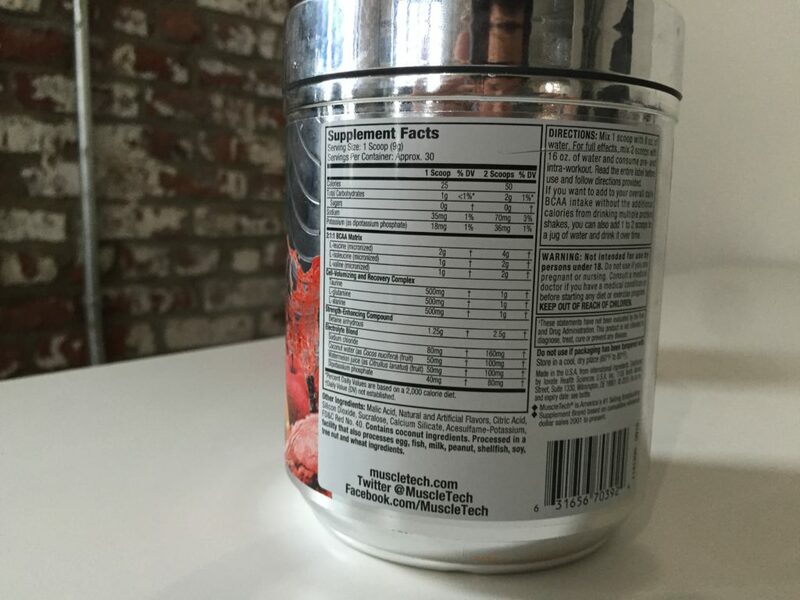 One serving has 4 grams of BCAAs in a 2:1:1 ratio of leucine, isoleucine, and valine. There are a lot of other ingredients. There’s an “Electrolyte Blend” of sodium, coconut water, watermelon juice, and potassium; a “Cell-Volumizing and Recovery Complex” of 500mg each of taurine, glutamine, and alanine; and a “Strength-Enhancing Compound” of 1.25 grams of betaine anhydrous, a chemical found in beets and leafy greens that is becoming increasingly popular in sports supplements. I’ll discuss the effects of all these ingredients in the next section. The “Other Ingredients” are malic acid and citric acid (for flavor), natural and artificial flavors, silicon dioxide and calcium silicate (anticaking agents), red food dye, and the artificial sweeteners sucralose and acesulfame potassium. It’s worth noting that there’s no soy in this product. You might already know about the benefits of the BCAAs themselves. Leucine, isoleucine, and valine, when taken in a ratio like that used in Amino Build, may promote muscle growth, focus, and endurance. The rest of these ingredients, MuscleTech attests, make this an even more potent at building muscle, strength, and endurance. Why? Much of the packaging focuses on the fact that MuscleTech contains betaine anhydrous, a chemical found in beets and spinach which has traditionally been used in medicine to treat high levels of homocysteine in the body, a condition which can be bad for heart health. Lately, it’s been gathering steam as a supplement for muscle size and endurance, and to MuscleTech’s credit, they actually cite two studies on the tub that point to this conclusion. (The studies use the same amount of betaine anhydrous that’s present in two scoops of Amino Build Next Gen.) The studies aren’t perfect and scientific consensus is somewhat divided as to whether it can be wholeheartedly recommended as a performance enhancing chemical. But MuscleTech does cite studies and show evidence for their claim, and I can’t begrudge them that. Then there’s the “Cell-Volumizing and Recovery Complex.” It’s important to note that MuscleTech seems to be counting on you using two scoops: one scoop is pretty low in BCAAs and most other ingredients. So, let’s say you’re taking two scoops. The one gram of taurine you’ll find in two scoops may indeed reduce the odds of developing muscle cramps and circulation. The bottle cites a study that showed it increased endurance, but plenty of other studies disagree; again, it’s hard to find consensus with this one. You can pick up 30 servings for $25, which results in 83 cents per one-scoop serving or almost 21 cents per gram of BCAAs. That’s quite expensive. Most popular brands come out at closer to 10 to 12 cents per gram of BCAAs. I tried the Fruit Punch flavor and it had the standard taste of sour cherry and watermelon candy that’s really common with Fruit Punch flavored BCAAs. I will say that just one scoop in 1.5 cups of water was very sour. Given that MuscleTech is encouraging two scoops at a time, I would want at least 3 cups of water with that. All things considered, this is a solid supplement. 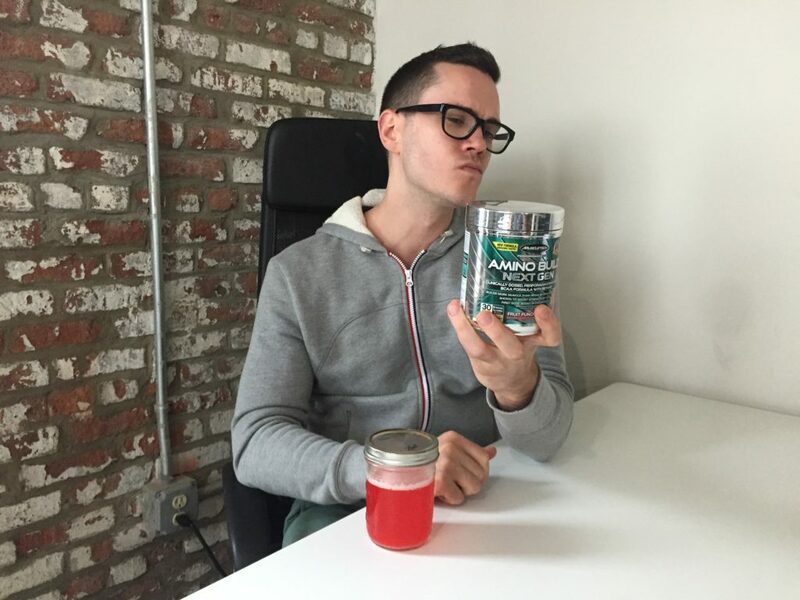 It’s hard to complain too much about the scientific evidence for and against some of the ingredients, as there’s a reasonably good argument to be made that betaine anhydrous and taurine may improve workout performance, and there’s a very good argument to be made that the alanine, electrolytes, and BCAAs will also help your workout. Since it’s so expensive, I’d encourage all consumers to do a little research and decide for themselves if this is worth the extra cost. If you decide it’s worth it, then enjoy — just remember to double the serving size and mix it with a lot of water.